Need your Dryer Serviced? Our Repairmen are just a call away. Having a hard time finding Dryer Repair in Stamford, Connecticut? Our expert appliance repair technicians are waiting to ease those frustrations. Often times we can get your broken dryer running like new the same day we come out. Over the years of repairing dryers we've encountered many different problems. Many of the common problems with dryers can be fixed by our team. 1) Drum Spins Fine. Heat Does Not Work. Depending on the model of the dryer you might be able to fix this problem yourself, but the time it takes to research the remedy is often not worth our inexpensive service call fee. 90% of the time if the dryer's motor is running but the inside drum isn't spinning it's due to a broken belt. Other times it can be from a bad roller or motor problems. If you feel that your dryer is getting to hot you'll want to stop the cycle. After you've stopped the drying cycle you can check to see if there's a clogged vent. Often times people forget to empty the lint trap for years at a time. In extreme cases the full lint trap can cause the dryer to overheat. The most common cause of a dryer not working at all is the fact that it's not turned on. Seriously, the dryer is literally not turned on. I'm sure you'd think that's an easy day for us, but in reality we're going to encounter a really ticked off customer. 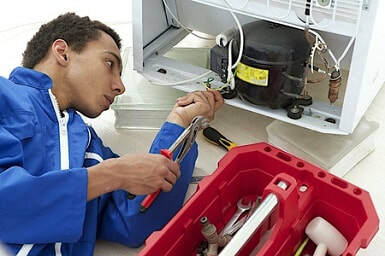 When our Appliance Repair Techs drive out to a home in Stamford, CT or other nearby towns we want to get your appliance repaired not just collect a small service fee. Make sure you check that your dryer's power outlet isn't tripped. You can double check to make sure the dryer is on by heading over to the fuse box or breaker. Other issues that can cause a non-working dryer is a bad timer, broken thermostat or bad terminal block. If you'd rather not trouble shoot your dryer problems yourself simply give us a call or contact our Dryer Repair Service in Stamford, CT.